Win £50 to Spend with Us! Ring received is the one in the first standalone photo. These are the perfect present and bohemian accessory in any season. Each one is individual and one-off to us. Handcrafted in Peru from alpaca silver, an alloy metal made to imitate sterling silver, non-tarnish and made to last. For a contemporary yet hippie look. Adjustable in sizes. Costume jewellery, keep away from water, hand creams and store in a jewellery box to keep them at their best. All jewellery where possible comes gift-wrapped. Coordinating earrings and bracelets on our shop! Because our jewels look better layered together. One either black leather or vegan faux suede choker of your size choice and 18" silver plated dainty chain. Chokers are S - 13" / 33cm, M - 14" / 35cm, L - 15" / 38.5cm & XL - 16" / 41cm. Two Tibetan silver charms which come on large jumprings so you can interchange them. Please select your size from the drop down menu. Want the sun version or a pair of mismatch instead? Find them on our shop alongside co-ordinating earrings! A pair of bohemian earrings are an essential for every hippie's jewellery collection. 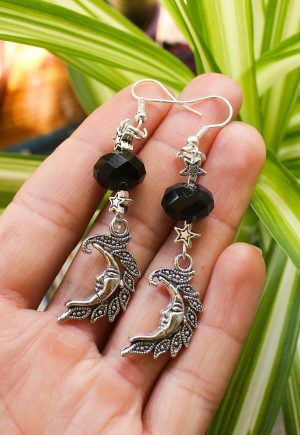 These are made using black crystals and boho silver tone findings with silver plated hooks. Each pair is lovingly handmade by Mama Adorned to a high standard. Costume jewellery, please keep away from water and sprays and store in a jewellery box. Our Ganesh chokers are back! Choose from either black leather or faux suede, with a deep gold tone Ganesh elephant pendant. Ideal for spiritual hippies and elephant lovers, lightweight and easy to wear. Sizes are S - 13" / 33cm, M - 14" 3 35.5cm, L - 15" / 38cm and XL - 16" / 41cm. Perfect for layering with one of our dainty chains. Shown here as a 15" necklace and a 14" choker on Sarah who's a UK8. Want the sun version or a pair of mismatch instead? Find them on our shop alongside co-ordinating earrings! A pair of bohemian earrings are an essential for every hippie's jewellery collection. 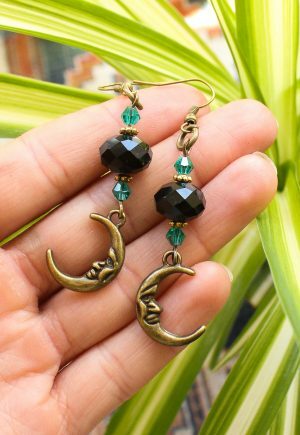 These are made using black and teal crystals and boho antiqued gold findings. Each pair is lovingly handmade by Mama Adorned to a high standard. Costume jewellery, please keep away from water and sprays and store in a jewellery box.